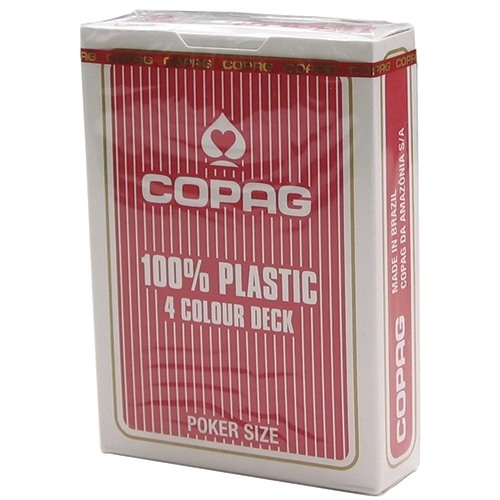 Notify me when " COPAG 4 Colour 100% Plastic Playing Cards Red " is back in stock. Copag 4 colour 100% plastic playing cards will bring a new element to your game! The card faces use different colours for each suit. The suit colours are not just Black and Red, the pack uses black for spades, blue for diamonds, green for clubs and red for hearts. This is a very popular card for Texas Hold'em to enable players to better distinguish suits from wherever you may sit on the table. The 4 colour playing card has been growing in popularity for years in Europe and is gaining a strong fan base in the United States as well.